A very good morning to all my dear (and patient) followers out there! It is apparent to me that my blog has unintentionally defaulted to a seasonal blog being that in my fast pace summer life, I just do not make time to post. Yet as soon as the weather turns chilly and we start to deck the halls for the holidays, oh what-do-you-know, up pops a new post! Wow, I am terribly sorry to let you all down by dropping the ball year round. So what have we been up to here these days? We recently dove into the daunting task of wallpaper removal in many of our rooms. Being a Victorian home, every wall here had been pasted with layers of paper. For months after moving here, I struggled between keeping our Victorian home congruent in period and style or making cosmetic updates to it. Over time, we realized that the dark, printed Victorian style is just not us, so we are now working at making this space ours! I cannot wait to show you some of our progress with before-and-after photo posts. If you stick this out with me, you will not be disappointed and I will show you every room change soon! In the meantime, I am visiting over at Postcards from the Ridge today! 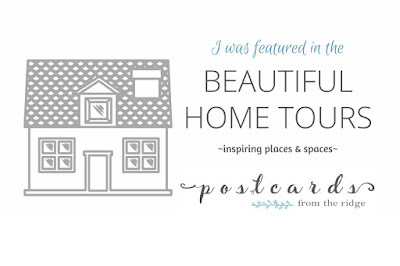 Angela has graciously invited me over to her lovely blog to share our fall farmhouse tour! Thank you very much, Angela! It is such an honor and delight to be featured there! Please *Click Here* to head over to check it out and say hello! Thank you all again for your great patience and choosing to continue to hang out with me here despite the lapse!